Note: If you did not receive the All Things Paper newsletter in your inbox this past Friday, perhaps you forgot to give permission to continue receiving it after the new privacy law went into effect on May 25. Not to worry! Just click this link to resubscribe and you'll be back on my mailing list. To catch the most recent issue, click here. And on with the show! 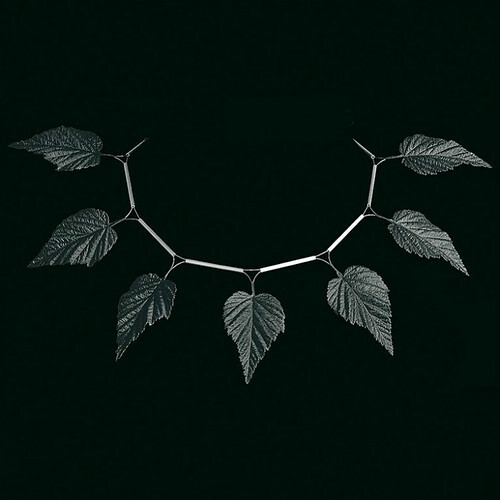 There never seems to be a shortage of beautiful paper jewelry to share with you. Enjoy this sampling of creative pieces made by ten worldwide artists. I came across embossed and sculpted paper jewelry by Anne Franke of Blanc de Neige in Dortmund, Germany on Instagram. Often she works with white, ivory, and cream papers and those pieces are gorgeous, but this black necklace... wow! Anne relies on antique embossing and stamping tools that were used to produce silk flowers to create elegant elements that she assembles with silver and stainless steel components. Archie Granot is a papercut artist in Israel who creates beautifully complex, custom cut marriage ketubahs, wedding gifts, and bat and bar mitzvah remembrances. 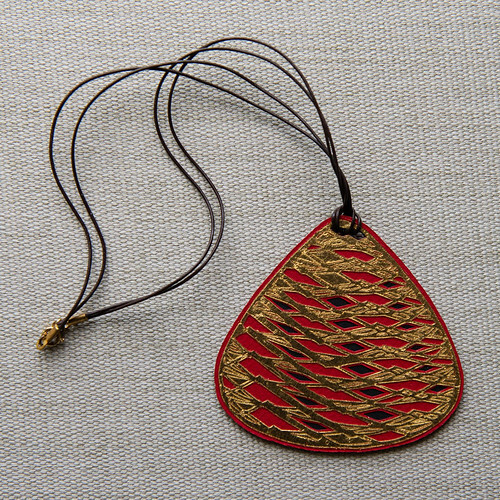 Recently he created this dramatic hand cut layered paper necklace pendant as a surprise for his wife and sent over the photo since he noticed I enjoy unique paper jewelry. It features gold leaf on layers of red and black paper and card. More than fifty pieces of Archie's papercuts will showcased in an exhibition opening in Krakow, Poland at the Library of the Jagellonian University, June 12 - July 13, 2018. If you are traveling through the St. Louis Lambert International Airport in Missouri, U.S., visit the Lampert Gallery to see prints of his work now through November 12, 2018. Archie Granot is on Facebook. 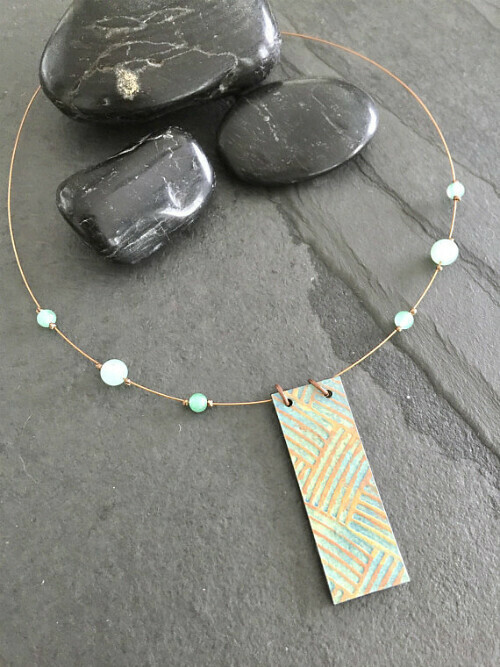 Jill Hamilton of Atomic Paper in Eagle, Idaho uses a multi-step process to transform plain card stock into shimmery, metallic-like jewelry with pretty findings. Each element is mounted on high-density craft foam for stability and is protected with a water resistant glaze. Atomic Paper is on Instagram. Giorgia of Linfa Creativa is a goldsmith near Rome, Italy. Passionate about creative recycling and a nature lover, she turned to paper to create whimsical jewelry. The perfectly made quilled designs Giorgia shares via Instagram include super-popular succulents along with pineapples, flowers, and eyes. Yes, eyes, ha! She blogs at Linfa Creativa. 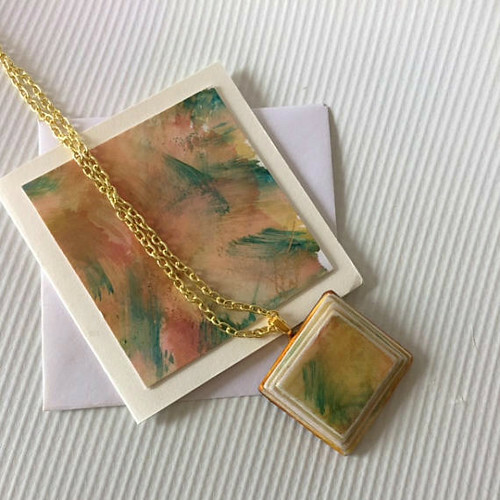 Jen Zeek of Jennuwine Design in Willits, California creates one of a kind pieces using her own acrylic or watercolor paintings. She includes a matching note card that was part of the original art work, a nice feature when giving a piece of her jewelry as a gift. Jennuwine Design is on Instagram. Aki of Autumn+Tree in Naselle, Washington is originally from Japan where she admired Japanese decorative papers while growing up. Two years ago she was given a large collection of Chiyogami and Washi papers by her grandmother who had collected them during the 70s, 80s and 90s in Japan, which led to jewelry making. Aki's petite, minimalist designs feature laser cut wood and paper and are coated with UV-cured resin. Amee Porter of am paperarts has such an interesting story! She lives on a million acre cattle station in Curtin Springs, Central Australia. 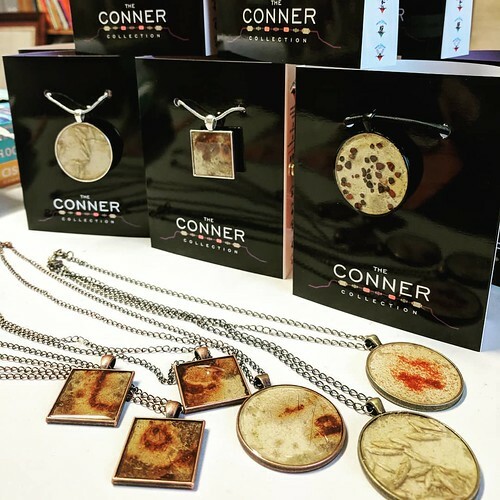 The paper she uses to create The Conner Collection jewelry is hand made from native Australian desert grasses that grow on the station. I highly recommend watching the short video at Curtin Springs Paper where you'll learn how this business came about and see more examples of Amee's artistic talent. You just might find yourself planning a visit to the station where you can stay, take a tour of the paper making studio, and make your own paper via a class. am paperarts is on Instagram. 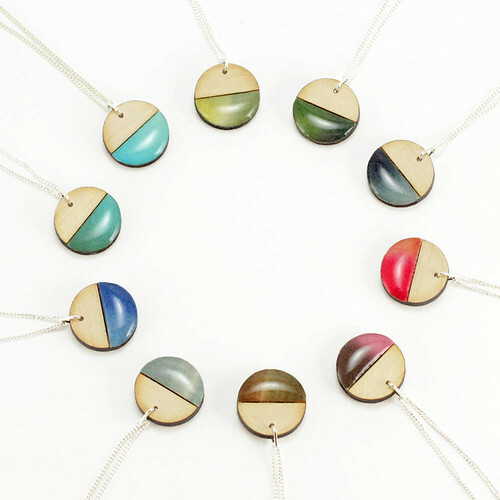 Nikolina Angelova of NiJewels in Edinburgh, Scotland describes her work as redefining the traditional use of silk in jewellery making. 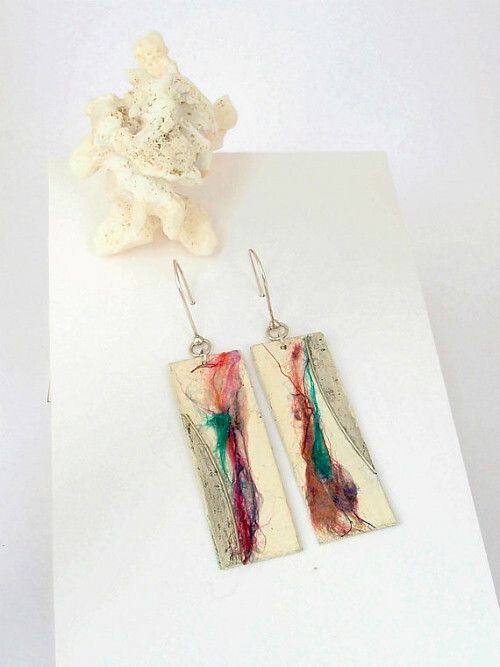 She uses rough silk thread along with stainless mesh and paper that she paints with acrylics to create mural-like earrings. They are water resistant and the hooks are sterling silver. Visit NiJewels where Nikolina is offering a 20% discount on your first purchase for a limited time and see her newest jewelry on Instagram. Barbara Brandimarte of Colla Carta Creo in Dübendorf, Switzerland has a degree in architecture, but rather than working in that profession she was drawn down the craft road to create paper jewels. "My home is my laboratory, my hands my tools, my mind my factory of ideas." 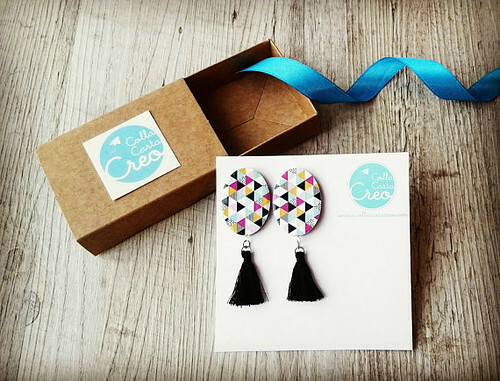 To make these stylish, water resistant earrings, she overlaps layers of corrugated paper and applies an original digital print with a geometric pattern. The black cotton tassels are on trend and the findings are rhodium-plated silver metal. Colla Carta Creo is on Instagram. Nancy Raasch of Raasch Design originally worked as a book designer in California, then moved to North Carolina where she designed and managed print advertising campaigns for national clients. 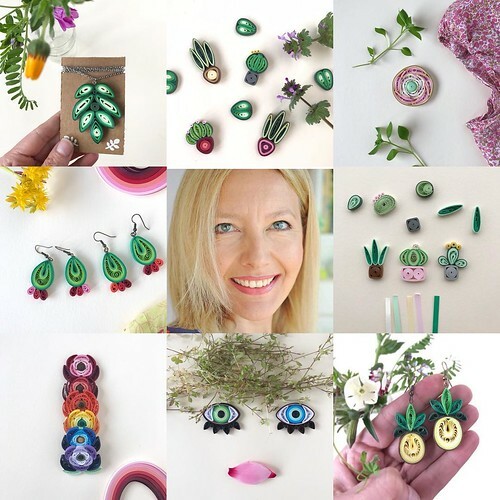 While recovering from a stem cell transplant in 2010 she became a jewelry designer who uses hand-felted mulberry paper (Joomchi), hand-made papers, corrugated cardboard, green packing material, papier mache, and wire to make "unexpected creative wear". 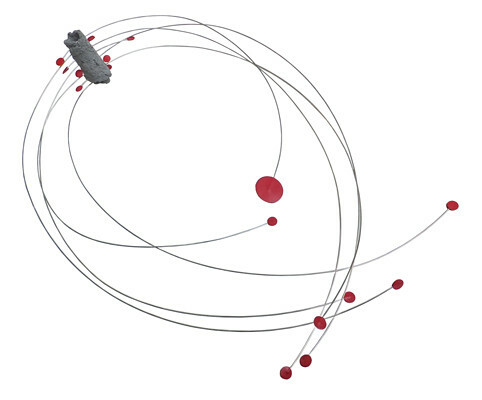 This fab Red Dot Necklace features water resistant paper dots, silver wire and paper maché. Watch for more paper jewelry artists in another round up soon. This is so amazing!! Wow! The collection makes me realized there is no limit for paper creativeness! I agree, color picker! Glad you enjoyed the post.